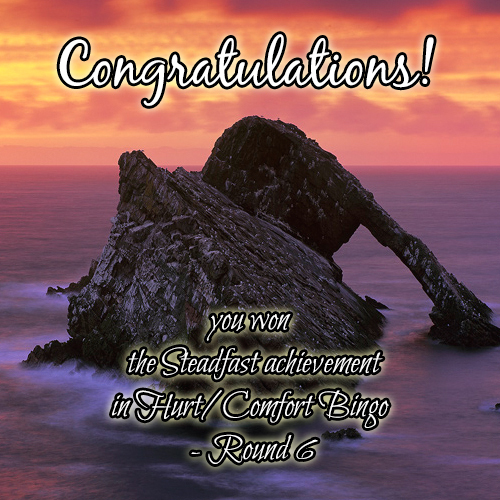 So, the hc_bingo achievements for round 6 have been announced, and I seem to have won... well, nearly everything! Here are all my shiny banners! 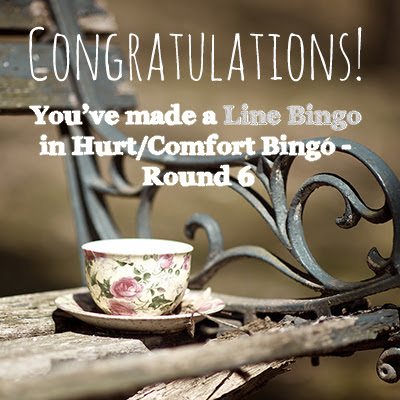 Line bingo - I actually completed three line bingos; two horizontal and one diagonal. I really went for it with the extras this year, and managed two cross squares and a postage stamp. I had been trying for a five-prompts-in-one-fic line extra, but I think that was just a bit too ambitious and didn't happen. 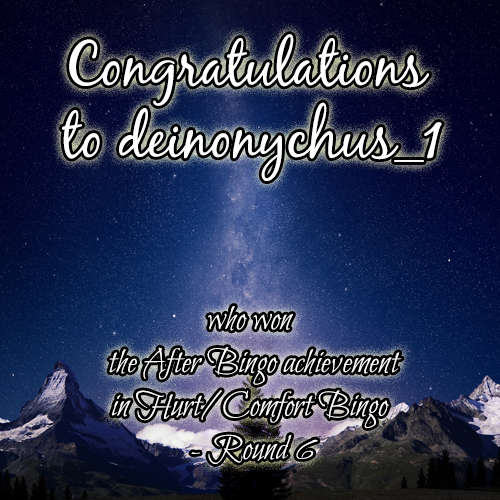 One and only achievement - competitive achievement for the first person to post a bingo in round 6. I really went for this one, and produced five wallpapers in a week! 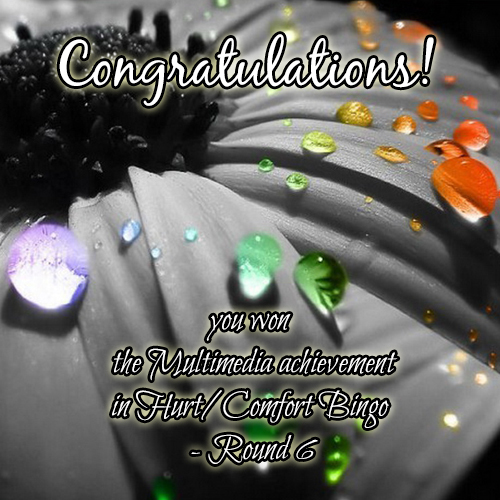 That bingo multi-tasked as my single media achievement as well. 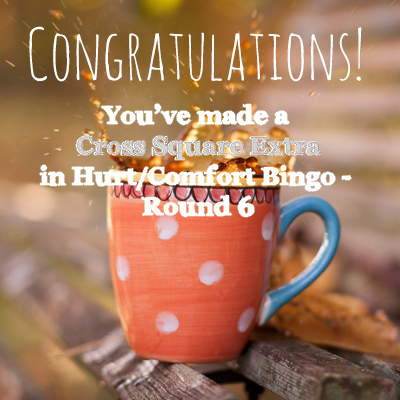 After bingo achievement - most number of extras submitted (see the two cross squares and the postage stamp above). 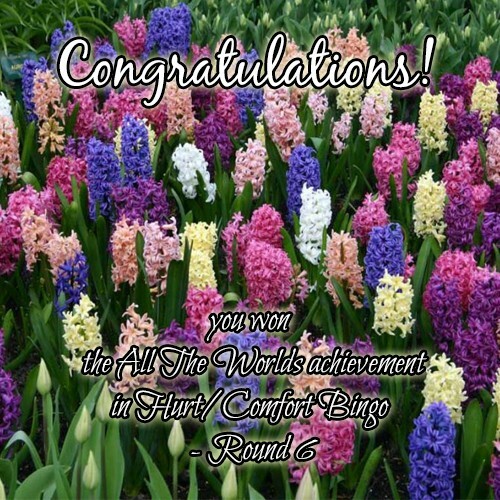 All the worlds achievement - all fills in a bingo are in different fandoms. And I didn't even need to write Casualty fic to get it this year! 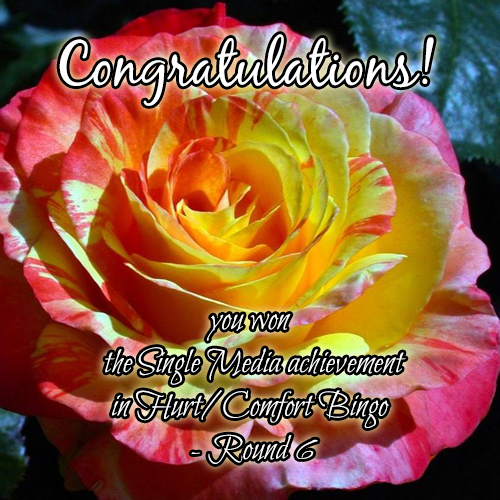 Single media achievement - all fills in a bingo of the same type. They exclude fic for this challenge, so I did an all artwork bingo. In fact, I actually didn't write a great deal of fic for my h/c card this time, there were an awful lot of wallpapers. 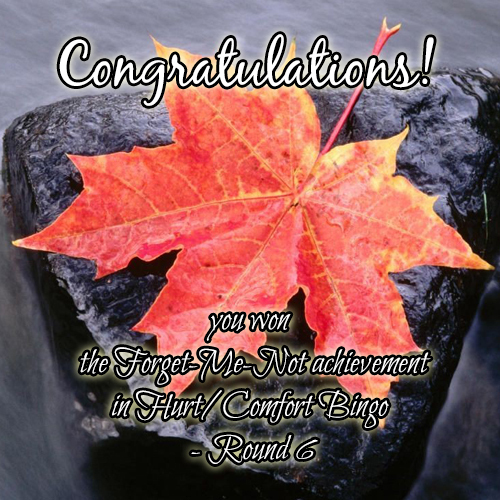 Forget me not achievement - posted at least once during amnesty (see, this bingo comm is so great you even get rewarded for posting stuff that didn't make it in time for the deadline!). 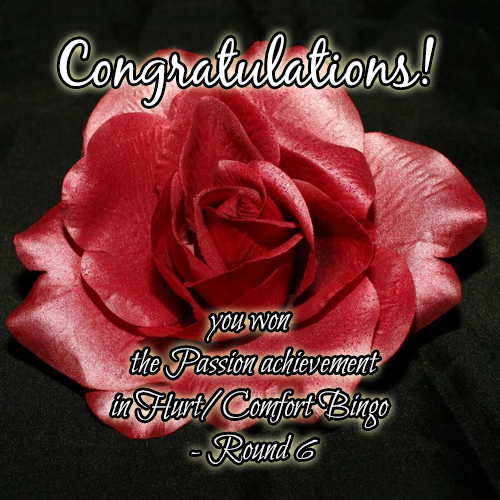 Passion achievement - completed at least one of the mini-challenges. 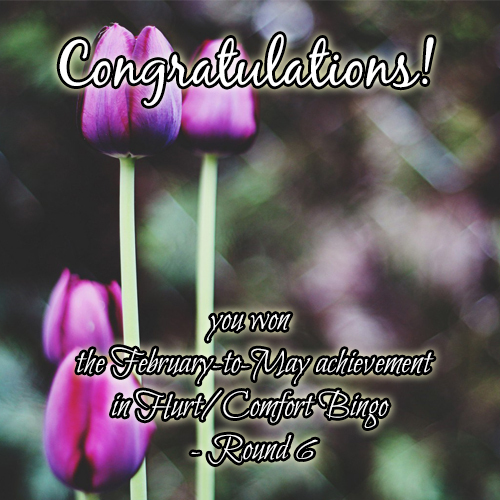 February to May achievement - this one is for completing all four of the mini-challenges. I only managed two last year, but with clea2011 and celeste9 encouraging/being competitive at me, I got all of them this year. 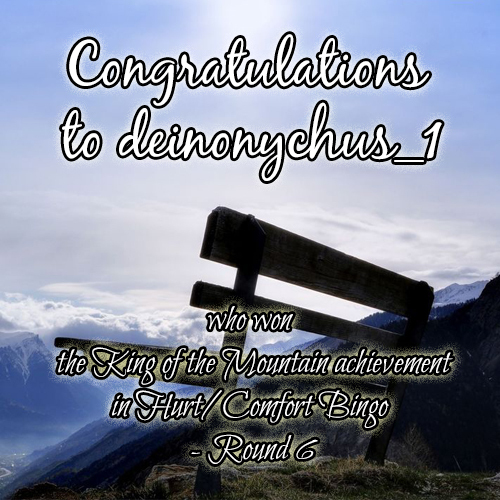 The individual banners for the challenges are all posted on the relevant entries here, here, here, and here. Serial pleasures - all fills in a bingo in TV series fandoms. Well of course you already have a blackout! It was you who encouraged me to be this competitive in the first place! Thanks. 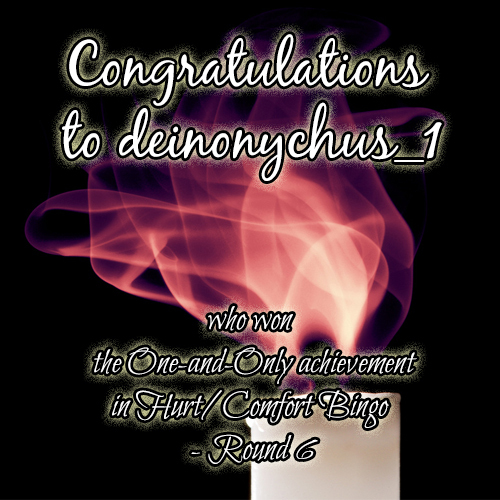 H/c bingo is really just an excuse for me to write all the angst and hurt/comfort that I would write normally, just with *prizes* as well!